You probably won't find us at the skatepark on Wednesdays. Recently we've been racing on the weekends. To be more accurate- not all of us have been racing, but those of us who have are having a BLAST!!! 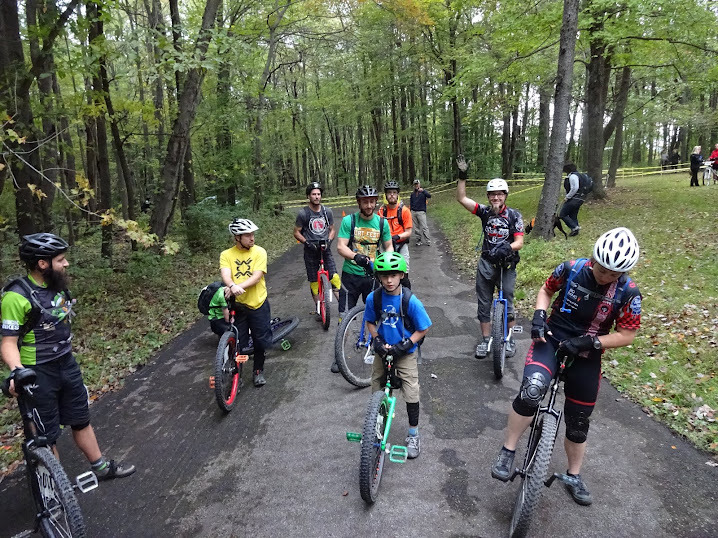 If you want to join in the fun The 10/3 cyclocross race at Grove City will be THE race to give uni racing a go! We won't be there. Some of it is a series of unfortunate events. Nothing life threating, but colds are annoying. We are planning to represent at the Month of Mud on Sunday in Bavington. We've got some great trails here in Western PA. They're great for mountain biking. Every Autumn some of these trails are featured as part of a fantastic series. www.monthofmud.org gets you the schedule. Unis are welcome. This year we plan on representing with the Butler Wobble at Bavington (9/19), Grove City (cx 10/3), and North Park (10/17). Dave will be racing the other 2, but unless you're a bit nuts you'll probably want to pass on Moraine. The start times for the unis aren't ironed out yet. Please contact Dave if you plan on attending. You can email him at dave(dot)bikes(at)yahoo(dot)com. Replace the (). We have enough with just us for a class of 5, but there's room for more! We're back at Father Marinaro skatepark tonight (8/31). We'll be there from around 6:30ish until close (8ish). Trials riding and pugil sticks? Tomorrow night is another bike/uni polo night. Ritts Park around 6:15 or 6:30. It might be an event on facebook too. It depends on if someone got around to posting it.